The 2016 NBA season has been going strong since early November and here a few tips and strategies you can use when making your daily line ups on DraftKings. First off and with no doubt, the way these guys have been playing this season and putting up astounding fantasy numbers this year, you always need to get R Westbrook, A Davis, D Cousins or K Durant into your nightly line-ups, whenever and wherever possible. But that is not always as easy as it sounds. Follow these simple basics, to work these guys into your line-ups every night and make yourself a fantasy winner on DraftKings.com………..
On fantasy basketball you are not just looking for the high point scoring players. You really want the players who are the best all around players. Rebounds, assists, steals and blocks are where the big fantasy scores come from and the players who can average a double-double every night and the occasional triple-double ( Russell Westbrook is a triple double beast this year) are the highest fantasy scorers. Player Minutes are another key stat to watch as the season progresses, it only makes sense that when a player is on the floor longer, the more opportunity he will have to rack up fantasy points. 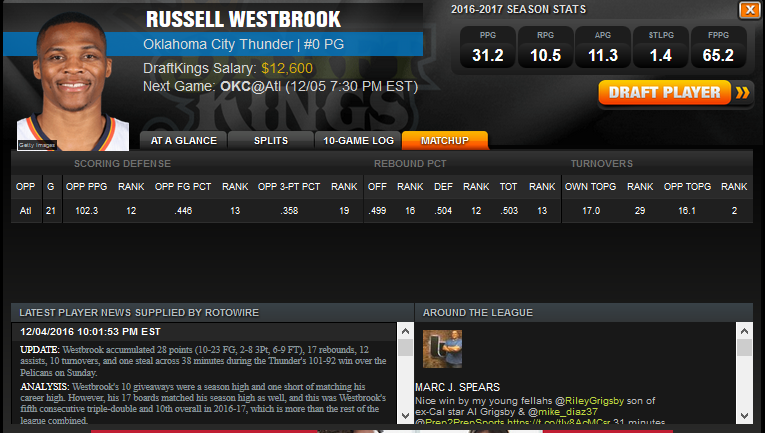 DraftKings has all that information right at your fingertips whenever you are on the Player selection screen. You can even find dozens of web sites that will give you detailed nightly line up advice, sites like https://twitter.com/DfsTheKing will give you detailed info and line-up suggestions. You’ll find every thing you’ll need on the DraftKings Draft Screen, including every game for that slate, every player available and be able to see info on every player/team you’ll need….. When you click a players name on the salary listing you’ll get details/player profile of that players stats, splits, game log, match-up and any recent news or fantasy outlook. These include over views, latest player news, last few game stats, and next opponent defensive rankings. You can use this info to make informed line-up decisions. Finding the best match-ups for your line up is easy on DraftKings. The player listing will give you a OPRK for every player listed. The OPRK is how that players opponent that night ranks against his position. The higher numbers are better than the lower numbers when looking at OPRK. For example: A Green OPRK number means that player is playing a favorable match up that night, his opponent that night doesn’t defend his position very well. A Red OPRK means his opponent defends his position very well and it is not a good match up that night. A Neutral OPRK is more of a neutral match up that night, his opponent is about average against his position that night. Using your Cap Space: You’ll never be able to start every player you’d like to every night. Your $50000 Cap will only allow you an average of $6250 per man. This means you’ll have to find a Value player or 2 every night. 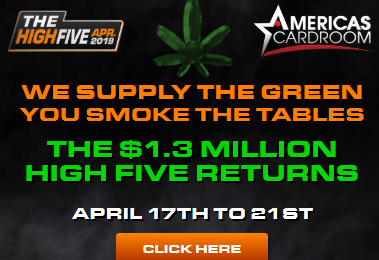 Fear not, there are plenty of $3K to $5K value players to choose from every night. Nagging injuries to star players are a good place to find these value players. Click any top salary player with an injury notation and read up on which player is expected to see more minutes should the injury be serious enough for a starter to limit his minutes or sit out a night or two. It is important that once you set your line up, that you monitor that roster for late scratches, warm-up injuries or players who sit just to rest (ie. San Antonio Spurs are famous for starters sitting out nightly). Any injury notation, for any player is cause for your concern. Sign up for a NBA Injury/News Mobile APP (https://twitter.com/DfsTheKing is good for late minute line-ups) or check your line ups before the first game tips off every night for the latest, up to date news each on each player. You can find each NBA teams depth charts on the player selection screen on the NBA games listed for that evening. Just click depth charts to see who backs up who for any team. You can also look for back ups on teams who are heavy favorites on a given night. The favored teams starters will usually be pulled out in the 3rd or 4th quarter with a big lead to eliminate injury risk and save their legs for later in the season. Those back up players additional minutes can add up to some nice fantasy points. This could also work the other way too, if a team easily blows out their opponent on a given night, star players on the winning team may not put up huge fantasy numbers (because he is sitting more) that night. That too is something to remember. Check out the Vegas lines for spreads and point totals and use that info as what games you may want to target or avoid. Always look for top players on games that are expected to be a close, hard fought game. They’ll be in the game longer and score more fantasy points. How much should I spend on each position? It is best to spend more Cap Space on PG’s, PF’s and Centers. They will score more on assists, rebounds, blocks and steals and will have better chances for the double-double or triple-double bonus points. 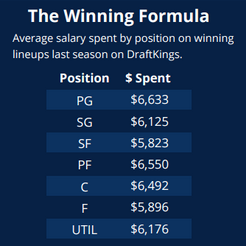 DraftKings posted this list of average position spend from last seasons winning line ups on their PlayBook. Daily NBA is a great way to keep a rooting interest in every game played this season and you can use your knowledge of the NBA to your advantage. Unlike the season long leagues that every one is used to, you don’t have to play every day if you don’t want to, you don’t have to worry about your rosters injuries, suspensions or any of the typical headaches that everybody dreads. Don’t forget you can follow your line-ups live on DraftKings and on DK Live the all new Free APP available on your APP stores on all your wireless devices. Join DraftKings Today and get a free play to Cash Paying Fantasy Basketball Contests when you deposit today……….